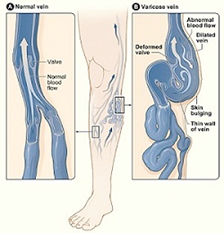 Varicose veins are superficial veins (just under the skin) that have become twisted and dilated because the one-way valves in them are no longer working. Therefore, the blood is able to flow backwards and collect in the vein creating downward pressurisation in the leg. Q: What symptoms might I get apart from the visual appearance? Q: What will happen if I do not have them treated? Varicose veins usually get worse over time but the rate at which this happens in individuals is unpredictable. Most people with varicose veins won’t get a leg ulcer; however, if you have skin changes already, you are at increased risk. If you injure your leg at your ankle with a break in the skin, healing may well be delayed because of your veins. Q: Am I at higher risk of DVT? Having varicose veins does slightly increase the risk of deep vein thrombosis and there is also a slightly increased risk of deep vein thrombosis from long haul flights. Q: How does the blood return from the leg if the vein has been destroyed? The varicose veins aren’t helping as they allow blood to stay in your legs. There are plenty of other veins to get the blood out, and checking that these are working is part of the ultrasound scan that a vascular surgeon would do before advising you on treatment. Q: What is my recovery after surgery? This is dependent on the treatment type you are having. You will generally have your legs bandaged after the procedure for 24-48hours and then wear an elastic stocking for a further 2 weeks. You will also be given painkillers and anti-inflammatory medication for 7days. During this time you will be able to and recommended to stay active and mobile. Specific aspects of aftercare and recovery will be given by the vascular surgeon depending on the treatment that has been undertaken.